How should I do it and what will I need? Soft blanket or towel – Spread it out for your baby to lie on. Safety –Always keep one hand on your baby and, if you are on a changing table, make sure you use a safety strap as well. Plastic basin or sink – Run warm water into the basin or sink. Don’t use too much water, make sure it’s shallow. Check the water temperature to make sure it’s not too hot. Other supplies: Washcloth, a towel, baby wipes, a clean diaper, and a change of clothes. If you’ve forgotten something or you need to answer the phone or door during the bath, you must take your baby with you, so keep a dry towel within reach. Never leave your little one alone in the bath. The American Academy of Pediatrics recommends gentle sponge baths during the first few weeks (approximately 3 weeks) until the umbilical cord stump falls off. Remember to clean your baby’s face face first, and then wash his body (move carefully around the umbilical cord if there’s still a stump). To clean his face, dip the corner of a washcloth or cotton ball into warm water, and gently wipe each eye from the inner to the outer corner. 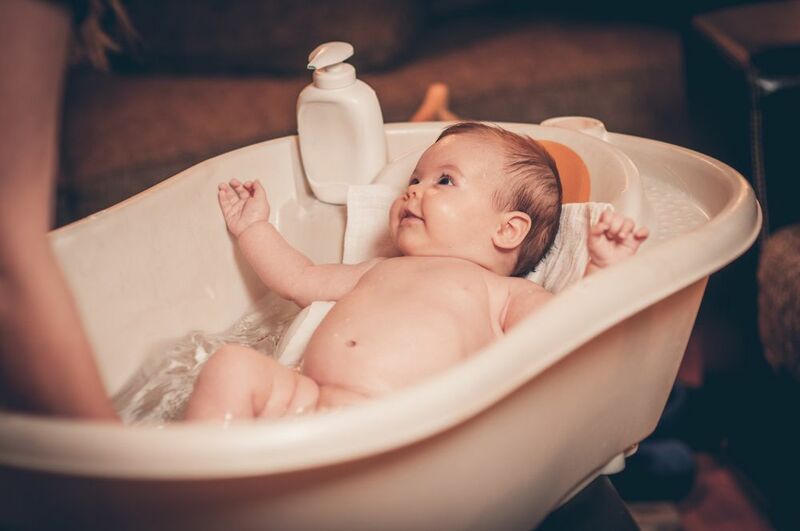 Bathing your baby is much more than just cleanliness. Giving your little one a bath can be a lovely way to strengthen your bond, as well as a learning opportunity! Help him explore his senses by trickling water gently onto his belly –he will probably giggle with pleasure– or pour water near him, check if he is captivated by the sound or amazed with his wide-eyed gaze! The first bath will be a sponge bath. Before you undress your baby, make sure you choose a warm room with a flat surface, it could be a bathroom, a kitchen counter, or the floor. Cloth hard surfaces with a blanket or fluffy towel. If your baby is on a surface above the floor, use a safety strap or keep one hand on him at all times to make sure he doesn’t fall.